How do I read an embedded resource (text file) using StreamReader and return it as a string? My current script uses a Windows form and textbox that allows the user to find and replace text in a text file that is not embedded. resourceName is the name of one of the resources embedded in assembly. For example, if you embed a text file named "MyFile.txt" that is placed in the root of a project with default namespace "MyCompany.MyProduct", then resourceName is "MyCompany.MyProduct.MyFile.txt". You can get a list of all resources in an assembly using the Assembly.GetManifestResourceNames Method. You can add a file as a resource using two separate methods. The C# code required to access the file is different, depending on the method used to add the file in the first place. Add the file to your project, then set the type to Embedded Resource. NOTE: If you add the file using this method, you can use GetManifestResourceStream to access it (see answer from @dtb). Open up the Resources.resx file, use the dropdown box to add the file, set Access Modifier to public. NOTE: If you add the file using this method, you can use Properties.Resources to access it (see answer from @Night Walker). Basically, you use System.Reflection to get a reference to the current Assembly. Then, you use GetManifestResourceStream(). 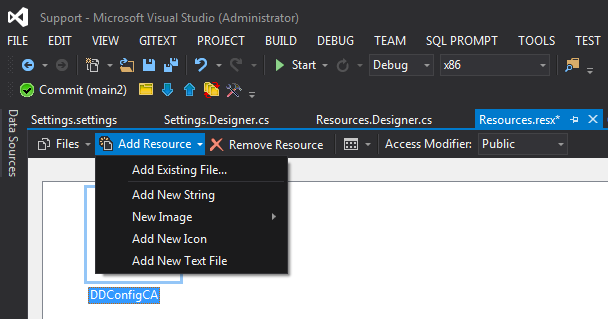 In Visual Studio you can directly embed access to a file resource via the Resources tab of the Project properties ("Analytics" in this example). When you added the file to the resources, you should select its Access Modifiers as public than you can make something like following. CLIST01 is the name of the embedded file. Actually you can go to the resources.Designer.cs and see what is the name of the getter. Something I learned just now is that your file is not allowed to have a "." (dot) in the filename. By all your powers combined I use this helper class for reading resources from any assembly and any namespace in a generic way. I was annoyed that you had to always include the namespace and the folder in the string. I wanted to simplify the access to the embedded resources. This is why I wrote this little class. Feel free to use and improve! The answer is quite simple, simply do this if you added the file directly from the resources.resx. With that line of code, the text from the file is directly read from the file and put into the string variable. 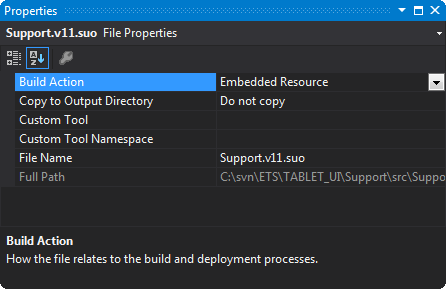 Read Embedded TXT FILE on Form Load Event. /// through the call stack. /// Error for if the Stream is Null. Create Void for IncludeText(), Visual Studio Does this for you. Click the Lightbulb to AutoGenerate The CodeBlock. /// another try catch here. What this achieved was this, a method to combine multiple txt files, and read their embedded data, inside a single rich text box. which was my desired effect with this sample of Code. Not the answer you're looking for? Browse other questions tagged .net embedded-resource streamreader or ask your own question. How do I read the contents of an embedded text file? Why can't I access a file using GetExecutingAssembly.GetFile()? How can i read data from .txt file using c#? Does disposing streamreader close the stream? How can I discover the “path” of an embedded resource?